It's Friday ... and just like that, the first month of 2012 is over! Crazy! How was January for you? I hope the year is off to a great start for you all. 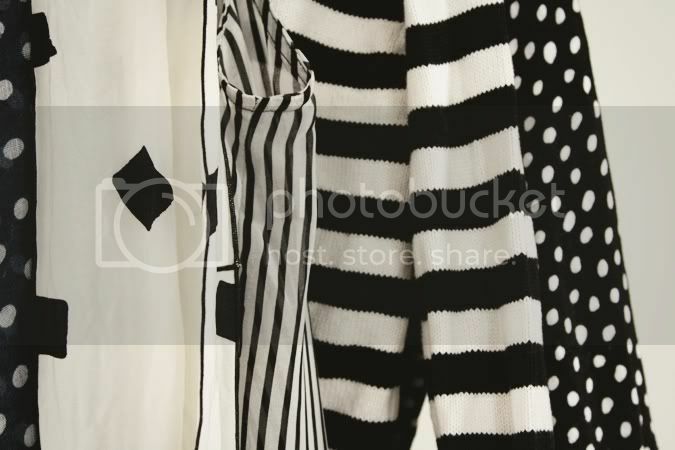 I picked up some new (well, used but new to me) clothing items and realized I ended up with a lot of black and white! I really have never been a big fan of black.. or white. But these 2 colors together are so classic. 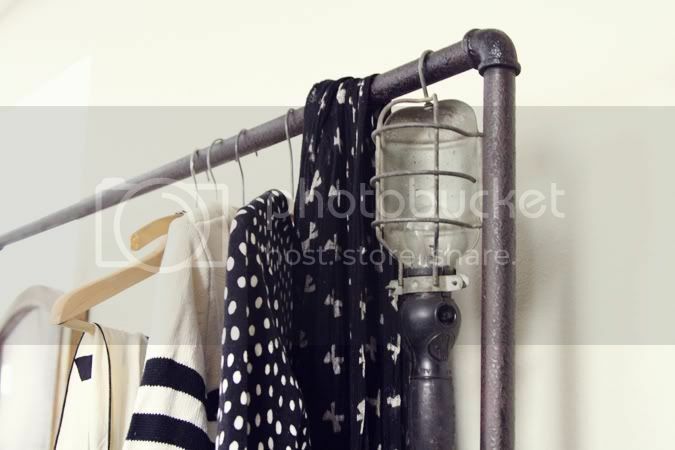 We have this industrial clothing rack furniture piece downstairs in our living room.. I don't really intend to use it to hang clothes - I want to get a cool light/frame installation going but we'll see. Do you have any fun weekend plans? I really hope to get a home tour up soon, but need to get a couple more things all set in our place before it happens. Thank you all for all your comments and thoughts this week. I loved all the comments about the Downtown Abby post - such a good show and so good to know fellow fans ;) Anyway, I'm going to launch a blog-comment project next week to encourage more community in this awesome blog-world we get to be a part of. Hope you have a terrific weekend sweet friends. xo. 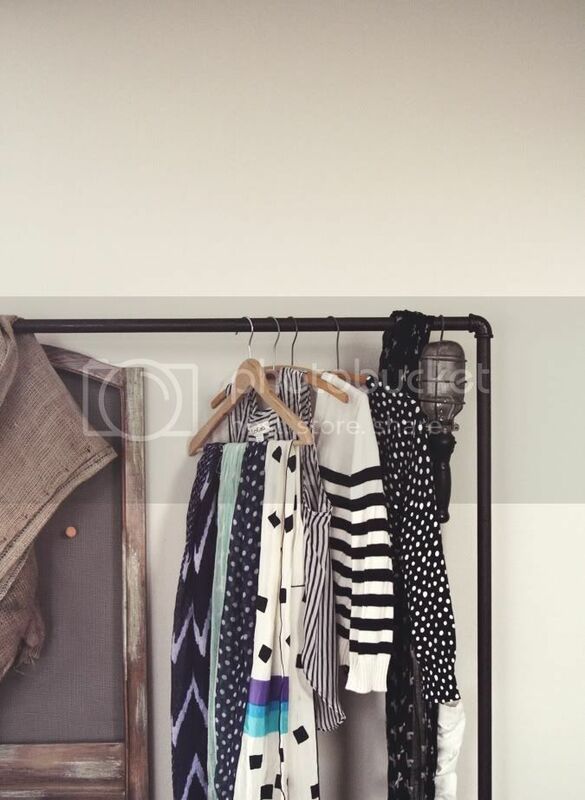 I want a rolling rack for my favorite clothes so much! Fun weekend plans? Oh, yes. We're going to an event that calls for cocktail attire. Getting ready is half the fun! i love that rack! i want to make on for my etsy shop!!! Love your blog - all the ideas, wow! Got your link from "How About Orange"...I can't wait to see how your blog comment project works out. In the meantime I'm going to grab your button and put a link to you on my blog.and then I'm going to explore more here. We're also non-denominational Christians (although I'm not mad about lables)but I never found a way to gracefully express my beliefs on my websites. And my husband would be more than a little jealous of your light fixture idea. Looking forword to seeing what you come up with! Happy Friday to you, Danni! Looking forward to learning more about your commenting project. I'm intrigued. :) xo. I've heard so many great things about Downton Abbey. Someday I may have to check it out, especially as according to Wiki, there aren't that many episodes. I like the rack too. And a very cool idea to use it for lighting. 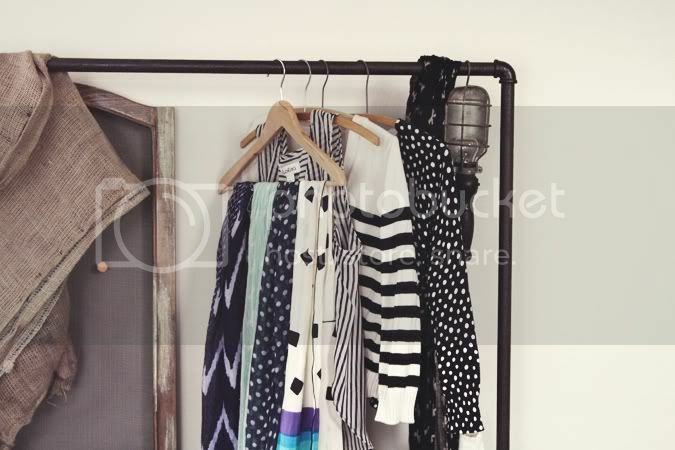 But I also like all of the black & white printed clothing on it- polka dots and bows- yes, please. Ohh I love all of the patterns! I get a little bored of black and white separately, but together? So classy! I love that rack! I found a tutorial to make one like it on Design*Sponge and plan on making one for myself because I never have enough closet space! I love black and white together, but I have become very fond of black and gray. It is practically my uniform now! I can't wait to see what new project you dream up, you have an amazing community here! I am loving this post! The best thing about a new year is NEW CLOTHES!!! So seeing this post has inspired me to get some spots into my wardrobe! I stop my your blog on a daily basis so thank you for the inspiration! This is so cool! Love that you've only put a few pieces on it, would look great with lights draped round it too!